Now that was a ride. For the first three years, I was little more than an idle observer of our FedCloud initiative; but, for the past 16 months, I have been working directly with Tom and John to bring our FedCloud adventure to fruition. It was a high risk venture [certainly higher than we ever anticipated], and it was wrought with tension throughout the journey [somewhere between white water rafting and waterboarding]. 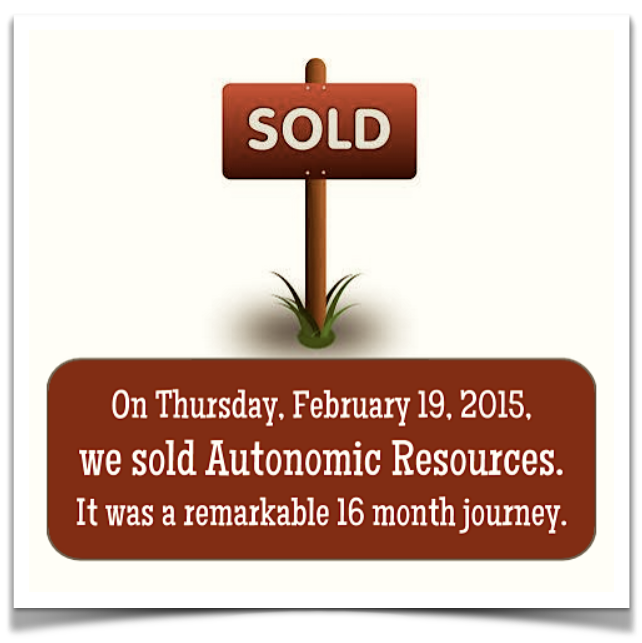 Fortunately, this past Thursday, we were able to complete the sale of Autonomic Resources [after nearly three months of a roller coaster ride of negotiations and due diligence]. Although the sale of Autonomic Resources’ remarkable FedRAMP ATO’s might put our FedDROP start-up in limbo, I couldn’t be happier for the entire Autonomic Resources family, especially the crew at our headquarters in North Carolina. And I am particularly proud to have been in the trenches with Tom and John seeing this thing through to such a successful conclusion. A special round of thanks needs to go out to Butch, Kerry, Mike, Lynn, Geno, and the Pfalzgraf team for bringing this one home. And an ever bigger thanks to Joe Kreuz, who got all these partnerships started over 20 years ago. When I look at our lineup of IT partnerships today, especially Capax Global, Sceven, ABX, and AP Phoenix [which just had it biggest month ever in January], I can’t help but be excited about what the future has in store. My family is healthy and happy, I have the best partners in the world, the sun is shining, and the sale of Autonomic Resources has provided us with the resources to expand exponentially. If I could drop a dozen pounds, I’d have it made. PS Tom and Anthony are both in Naples today, and we will be over at the Shoppes at Vanderbilt checking out a potential location for our warm weather ABX [along with a new TW&Co]. I’ll keep you posted.